Although not a news piece as such, an interesting ditty was received at TUW this week concerning a Number Six doll which had been produced a few years ago for the Mego Toy Museum. 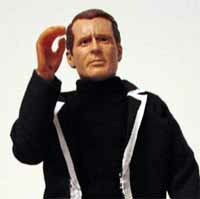 Writes producer and maker of the doll, Brian Heiler; "I made Patrick McGoohan Prisoner dolls a couple of years back. It caught the attention of his granddaughter who ordered one (I gave it to her) it was given as a gift to Patrick who declared it his favourite gift!" "Sean Sansom sculpted the head. Sean is a SFX artist and has worked on movies like "Cinderella Man" and "Dawn of the Dead". He at one point made a model kit of Number Six that some collectors might own." With thanks to Spencer Peet and Brian for this news item.